Destination Marketing Organizations (DMOs) in 2016 are reaching more potential travelers than ever before. With the power of new media complementing the continued reach of print guides and traditional media, almost all destinations are delivering more content to more consumers than ever before. At the center of this expanded audience is a destination’s website. Across Miles’ 80+ DMO clients, average website traffic in 2015 topped 1 million unique users for the year (“Users” in Google Analytics FY 2015), highlighting the reach of a destination’s website as its central marketing platform. But are these millions of users actually influenced by the website? Specifically, does the website’s content and features help them to decide to travel to the destination? If so, what is their length of stay and visitor spend? In short, what is the ROI of a destination website and how does it drive actual visitation, new spending and tax revenue? The 13 DMO websites involved in this largest-ever DMO website conversion study include both smaller and larger organizations such as Visit West Hollywood, Sonoma County Tourism and San Francisco Travel Association. Miles is working closely with its longtime research partner, Destination Analysts, and the Destination Marketing Association of the West Education & Research Foundation (DMA West Foundation) to answer these critical questions. 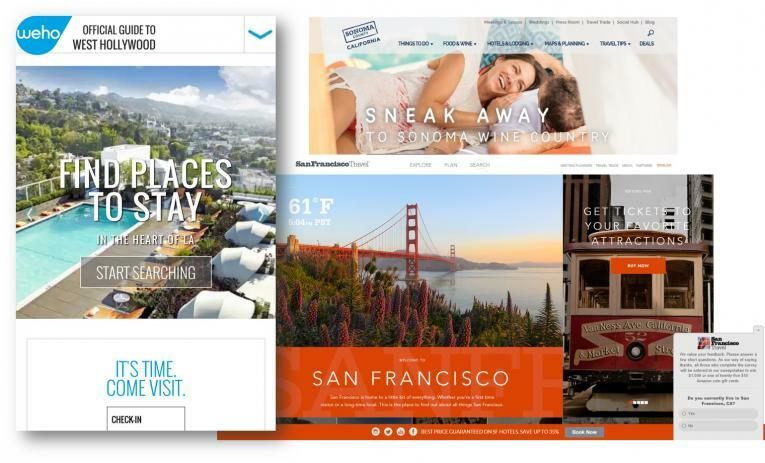 Miles is the sole underwriting sponsor of a major website conversion study of 13 Convention and Visitor Bureau (CVB/DMO) websites – conducted by Destination Analysts and organized and subsidized by the DMA West Foundation. It is the largest and most definitive study of its kind ever undertaken. The objectives of this in-depth multi-destination website study are to define the reach, impact and actual visitation created by destination websites – and to define the content, features and marketing that characterize DMO websites that drive the highest ROI. Running through 2016, the yearlong study allows users to be surveyed, re-surveyed and actual visitation and spending in the destination to be measured. In another first, the study combines visitor responses with analytics data. Qualaroo, the intercept survey platform used by Destination Analysts (after testing and evolving it with the expert support of Miles), integrates traditional survey responses with anonymized Google Analytics data – allowing the “What?” and the “Why?” of the users’ interaction with the website to be understood in unprecedented ways. Early results highlight that there is a wide variation amongst the DMO websites in the type of potential travelers – from a minority to a majority of users who have already decided to visit a destination. This first-of-a-kind research was made possible by the DMA West Education & Research Foundation, which contributed more than $60,000 to subsidize the cost by 30% to 50% to 10 of the participating DMOs. Miles also came on board as the sole underwriting sponsor with dollars and expertise to help integrate insights yielded from site analytics. The profound learning and benefits of sharing insights and benchmarking data (all averaged and anonymized) amongst the participants prompted 13 DMOs to invest. These 13 range from major cities such as San Francisco and Albuquerque to smaller destinations such as Sonoma County, West Hollywood and Yakima Valley in Washington (see full list at bottom). The DMA West Foundation, Destination Analysts and Miles will report back later in the year on the interim results and then in 2017 with fuller reporting on this exciting research. Separately, Miles has also been working with Destination Analysts on another innovative conversion study – this time with Visit St Pete/Clearwater and big data provider Sojern. Just concluded, this integrated study combined even more data points: survey responses, analytics data and Big Data – actual airline, hotel and OTA bookings from Sojern – all integrated into a rich, powerful reporting framework. We will summarize the key lessons, insights and takeaways in a future blog. These are exciting times.The range of tools, technologies and data sets available to DMOs to help measure and report on real results have never been stronger. This includes the ability to measure ROI all the way through to actual visitation, spending and tax revenue – the “holy grail” of demonstrating value for DMOs. We are at the start of a golden age for data-driven, results-focused destinations. Thank you to the CVBs participating in the DMA West Foundation Study. As of May 1, 2016, these partners include: Visit Oakland, San Francisco Travel, Travel Lane County, Visit West Hollywood, Sonoma County Tourism, Visit Laguna Beach, Albuquerque CVB, Big Bear Visitors Bureau, Central Oregon Visitors Association, North Lake Tahoe Resort Association, Park City Chamber of Commerce/CVB, Washington County Visitors Association and Yakima Valley Tourism.